Or the Events and Workshops Category (on side bar) for more details! The FarmHouse, at North Slope Farm, is a great setting to gather, learn and share. Participants in our Events and Workshops are encouraged to explore the Farm trails and visit with our unique nature..
We encourage you to reach out, to Mecquel, via email, to learn more! 1) Check ‘Crops Available Now’ Page (at top) for available items..
2) Call or text us at 609-647-9754, leave message what you’d like, and when you can pick-up, and your contact info..
FOR PEOPLE OF ALL AGES…. This class will be lead by Pat Chichon, nurse practitioner, herbalist, homeopath, nutritional consultant, who has been practicing in South Hunterdon County, NJ, for over 30 years, working with people of all ages. Contact Pat, email; Chrysalisc@aol.com, Phone; 609-397-1466.
or call 609-647-9754 and leave message.. 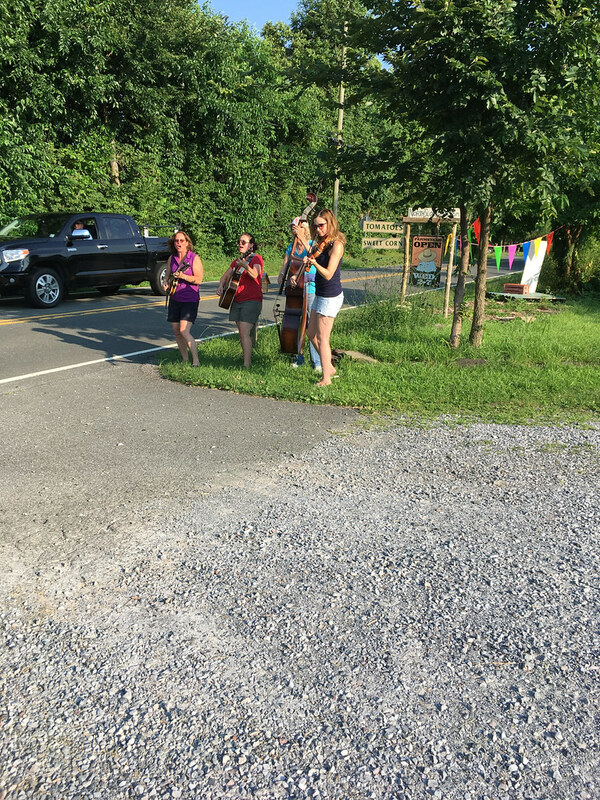 Enjoy Free Live Music, even stroll a farm Lane or Path.. Plenty of seating and picnicing is encouraged..! Come learn more about this illness. Learn how to prevent it, how to deal with Lyme if you think you may have been exposed, how to work with your body and treatments if you are diagnosed, and how to prevent / deal with the long term issues. Most important, learn strategies so you have less to fear of Lyme. This class will be lead by Pat Chichon, nurse practitioner, herbalist, homeopath, nutritional consultant, who has been practicing in South Hunterdon County, NJ, for over 30 years, and works with people of all ages. You can check out her website at www.Chrysalisc.com. Plenty of Time for Questions! This class is being hosted by and held at the North Slope Farmhouse, located on the corner of Route 579 and Rock Road East. Wednesday June 21, 2017 – 7 pm and on..
Pot-Luck Dinner, BYOB, Live Music and Firelit night, Plus fireflies and Sunset.. 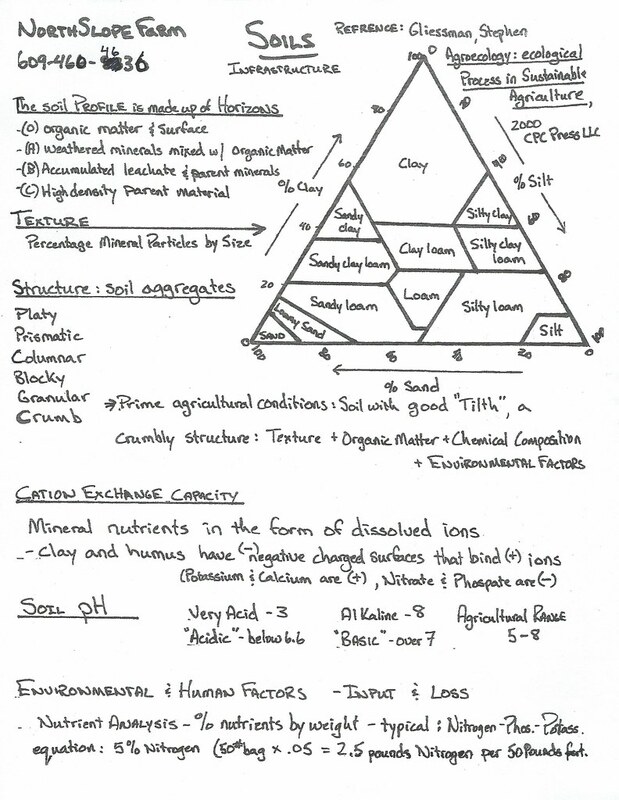 Fertilizer equation at bottom of handout..
NOFA-NJ, the Northeast Organic Farming Association of New Jersey, invites you to visit North Slope Farm, 6 miles to the east of Lambertville, NJ, to discuss Carbon Sequestration, as it relates to agriculture. PLEASE follow links, above, or from our Home Page, to NOFA-NJ to sign up for this workshop – Please become a member of NOFA and support Organic! Farmer Mike will introduce the topic, as it relates to his experience and perspective. We will encourage participants to express their understanding or questions about Carbon Sequestration. Join the workshop on a walking tour of farming practices at North Slope. North Slope Farm has served its communities, for over 20 years, with Organic Produce, Herbs and Flowers. In that time we have found Organic Practices, when actively applied, to build the vigor and viability of our soils. Cover-cropping, Living Mulches, reducing soil tillage and fostering wild areas and field strips are integral to a healthy future, and we are glad to share that with you!